I have been working on this one for some time, but didn’t feel like I could release it until I got a really solid long run of 20+ miles in, which I did this morning. Some of you may have read the review that I did of the SCARPA Tru last fall (found here), which was not only my first review of a Scarpa shoe, but also my first experience with them. Since writing the review, I have continued to have success with the Tru, including during my first 100 mile completion and, most recently, a podium finish at the Grand Canyon 50K. This has made me want to take a closer look at the brand, so I reached out to Scarpa to see if I could take a look at another one of their shoes, the Spark. They were happy to oblige…let’s take a closer look. Out of the box, you can definitely tell that these are related of the Tru. They share the same outsole lug pattern and have a similar feel underfoot. The main difference aside from a bit more cushioning is in the upper, which definitely has a heavier/sturdier look to it. Despite that, the shoe only have ad added weight of 0.7 oz compared to the Tru. The Spark fits very similarly to the Tru, which is to say, it is not too snug and not too loose on the foot. It holds the heel fairly well in most scenarios and fits the foot well from back to front. It does feel a bit softer in the upper than the Tru, especially in the heel where there is a bit more padding. A couple observations on the fit…it does seem to slip a bit on steep downhills. However, unlike the Tru, it has an upper lace eyelet that allows you to tie a heel lock that helps to alleviate this a bit. I also noticed that after running on side-sloped trails for a longer period, I got a little sore on the ball of my foot (although had no blisters). This, of course, is a problem I have had with most shoes and may not be completely avoidable. As I mentioned, the outsole is identical to that found on the Tru, so my experience was basically the same. The shoe performs well on varied terrain. No blisters or hot spots and no slipping around. One thing I will note here about this outsole that I didn’t cover in my Tru review is how well it sheds mud. I wore the Tru through some severely muddy conditions at the Grand Canyon 50K (after my initial review) and had ZERO issues. I mention it here because, as I said, the outsole is the same and therefore I would expect it to perform similarly.. Lastly, the shoe has a very stable platform, which is of high importance with me as I have a tendency to roll my ankles from time to time. I try to test all of the shoes I review on technical terrain for this reason (sometimes to my own peril) and I didn’t have a single incident with the Spark. Here are details and Strava links for a few of my main runs with the Spark. The upper is definitely more sturdy than the Tru. If you are looking at Scarpa and don’t know which one to get, I would recommend this one if you are looking for a slightly heavier trainer or you have a history with wearing out uppers quickly. This one will last longer. The outer works well on just about every surface, giving you the confidence to run to your fullest without worrying too much about losing your footing. The one thing that this has that this shoe has that the Tru doesn’t is an upper lace eyelet, which is a big deal for me. I like having the ability to tie the laces further up my foot or tying in a heel lock if needed. Solid, yet flexible platform. I had no issues with ankle stability at any point in this shoe. I know this is personal preference, but they feel a bit too soft and bulky for my taste. Even though they aren’t technically that much heavier than the Tru…they feel like it. I prefer a lighter feel. Still seems too have a problem with slipping forward into the toe box on steeper declines. While I like the addition of the upper eyelet as I have already mentioned, I definitely like the lighter feel of the Tru, so I am going to give it a slighter lower score in comparison. I think there are ways in which they could offer a sturdier upper without having a bulky feel to it, and I hope that they do that in future iterations. 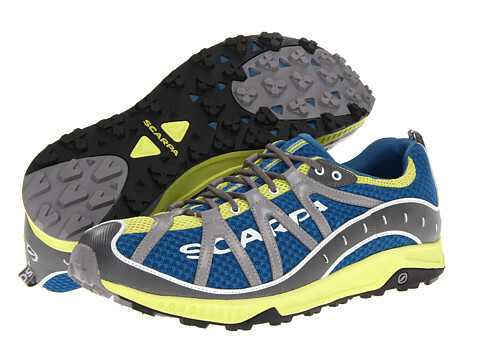 Still, this is a solid shoe from Scarpa and worth trying if you are feeling on branching out. One additional note as I am posting this the weekend after the Outdoor Retailer Summer 2015 show. I got a chance to see the new trail shoe line from Scarpa. Now I have been impressed with what I have seen so far from them overall, but the new line looks AWESOME. They are due out next Spring and I am not sure what this means for the current line (they couldn’t say), but I would guess they may move away from it. That being said, would I hesitate to buy another pair of these? Nope. They are a good shoe and worth getting some use out of while waiting to see what else Scarpa brings to market. This entry was posted in Gear Reviews and tagged product review, Scarpa, shoes, Spark, trail, trail running by Ultrarunner Joe. Bookmark the permalink. I really liked the Spark, but wish they would have gone with a little more protection in the forefoot like the Rapid LT. I could feel the bruising ache on my forefeet when I had longer days on rocky trails. A really nice shoe though. Nice review!